Google image search (right clicked your pic, selected "search google for this image"). It took me to the Outlet section of the site. YOU HAS MAGIC! Thank you, Google-shoe goddess! I looked in the outlet section, but I tried limiting my search to "green" and it wasn't an option, so I assumed the shoes weren't in he outlet. Weird. Thanks again! for 40% off, they might be worth it just to look at in my closet. They are lovely - even if you just pat them occasionally. My jaw... it is on the floor. @Shelby, I NEVER in a MILLION YEARS would have picked those out as something you'd like. @firebirdsinger, I think it's the color. Although I don't think I would ever buy them for myself. I'm too short to really pull off a gladiator style. @annaP I've been meaning to post this for a week or so, I saw these at my local TJ Maxx and thought of you. 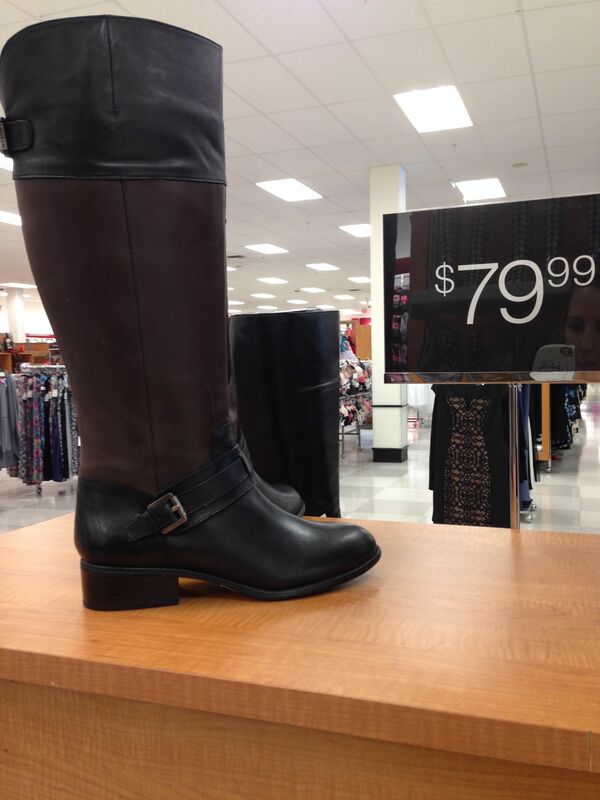 Are you still on the hunt for two-tone riding boots? @AlisonHendryx, sorry to have missed your post! Funnily enough, I bought those at Winners (Canadian version of TJ Maxx) last week! The kittens have the best taste ;-), thanks for thinking of me! (Clicky.) I've been looking for something to wear with black dress pants during the winter that aren't knee high boots and I totally fell in love with these. And since they're from Naturalizer they are actually super comfortable! I can't wait to wear them! Those are gorgeous! And Bettina is my mother's name so I like them even more. oh @alisonhendryx Cole Haan is my shoe weakness. I love those green heels, but don't really wear heels anymore. OF COURSE they have a version of it in flats. Why oh why do they have to have my size?! Just bought the prettiest party shoes ever! SHINY! @alisonhendryx I was logical and decided I wouldn't actually wear them all that much. Those are so fun! Isn't it the best feeling when you get something and you are so in love with it you wear it right away! I got a new dress over the weekend and I need brown tights to make it work, which is bumming me out because I just adore it and want to wear it right freaking now! I love the flip side of "must wear ASAP"..... is..."can't wear without the perfect accessory". Such a bugger. It's like trying to explain the black shoe conundrum. Yes, I have 5 pairs of black shoes, but none of them match my new dress! I got a pair of black moto jeans with the leather patches over knees and felt like they never looked quite right with my other footwear. Now they are PERFECT because of the new boots :-). J'adore the new boots so much, I ordered them online and gay gasped when I took them out of the box. Unfortunately I can't wear heels and I can't keep d'orsay pumps on my feet. I'm so glad you bumped this thread, @foodycatalicia, I had kind of forgotten it exists. Those shoes are gorgeous. Just gorgeous! My girlfriends and I went to the travelling show of this exhibit last weekend at the Currier Museum in Manchester NH. I highly recommend it for any Boston area kittens who want a short road trip and anyone else, keep an eye out. It was so fascinating! They are organized by theme, so like, metamorphosis, reinvention -- a whole case of platforms from the 1800s and the 1930s that looked straight disco! @foodycatAlicia those are gorgeous. Love them. @AlisonHendryx I will have to check this exhibit out. Sounds like its up my alley. I love those @foodycatAlicia!! I've never been good at pulling off Mary Janes. With the pointed toe and the narrow and forward placement of the strap they don't look like a Mary Jane, and may have fewer of the issues of a traditional Mary Jane. I also think they are gorgeous and very covetable. Sadly no money in the shoe budget right now. No money in the shoe budget for me either. And sadly, I have wide feet and these look pretty narrow. So I just have to admire them in pictures. @AlisonHendryx I tried those green heels on and didn't buy them. They were sooo comfortable, and super cute, and I couldn't bring myself to spend the money. I still think of them as The Shoes That Got Away. So I'm right there with you -- Lovelorn, party of 2, your table is this way. my jaw. it is on the floor. i loves them. I bought these. I love them SO MUCH.